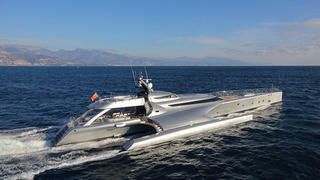 The 53.2 metre trimaran motor yacht Galaxy of Happiness has been listed for sale by David Legrand at Fraser Yachts. Built in a GRP and carbon fibre composite by Latvian yard Latitude Yachts to a design by Coste Design, she was delivered in 2016 and is Bureau Veritas classed. Flexible accommodation is for up to eight guests in three cabins consisting of two master suites and a twin VIP suite with two Pullman berths. All cabins have entertainment centres, Samsung television screens and en-suite bathroom facilities. In addition, five crew are accommodated in three cabins aboard this yacht for sale. An expansive main saloon uses Alcantara fabric, carbon fibre and zebrano wood joinery to create three separate relaxation areas. There is comfortable seating, a bar and an entertainment centre including a large Samsung flat screen television and a Control4 server to deliver on-demand video and audio throughout the public areas. The aft deck area is set up for al fresco entertaining and dining with a bar close to hand while the upper deck, behind the wheelhouse offers a Jaccuzi, Samsung television screen and bar, sheltered by a Bimini top. Twin 2,600hp MTU diesel engines give her a range of 2,300 nautical miles at 11.5 knots and two 60kW electric motors located in the outriggers provide silent cruising with zero emissions when desired. Lying in Imperia, Italy, Galaxy of Happiness is asking €29,800,000.